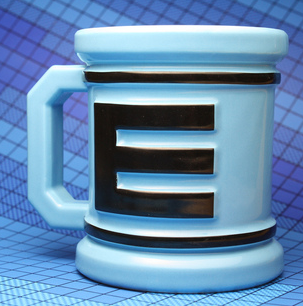 Fangamer's E-Tank coffee mug is coming back! Having exceeded their sales projections and shipments back in the Winter, Fangamer is gearing up to offer a second helping of mugs to customers who missed out the first time around. Slated to ship out in mid June, the newly redesigned mugs sport a few cosmetic changes. All mugs now boast smoother, cleaner interior walls and a thinner lip for easier drinking. As a trade-off, they're a little bit heavier, weighing in at 1.25 lbs. Packaging has also been redesigned to compensate for these changes. Pre-orders are currently available here. Subsequent mugs purchased after June will be delivered two weeks after purchase in order to allow time for both production and shipping. In other words, the sooner you order, the sooner you get your mug! If las time is any indication, these will go fast. Pre-order yours ASAP. I already got my wave one mug...coolest mug in existence. I just wonder if these new changes will really make a difference.